Well, there’s not much I can add to what the Canadian — and indeed, the Québécois, media — have covered in the past 48 hours. 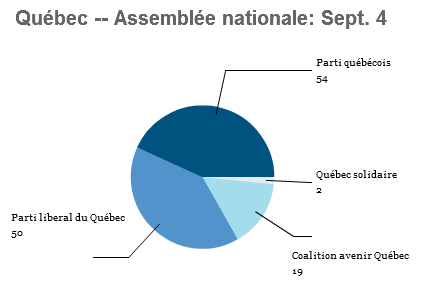 In Tuesday’s election, the Parti québécois (PQ) finished first with 31.94% with 54 seats. Premier Jean Charest’s Parti liberal du Québec (Liberal Party, or PLQ) came a very-much closer-than-expected 31.20% with 50 seats. The newly-formed Coalition avenir Québec (CAQ) trailed narrowly with just 27.05%, but won just 19 seats. That’s surely somewhat of a disappointment for its leader, François Legault, but the party did very well in the Québec City region and former Montréal police chief and anti-corruption figure Jacques Duchesneau won a seat. Nonetheless, the CAQ was the significant gainer in the election and Legault has an excellent chance to build upon his success. As such, the PQ leader, Pauline Marois, will form a minority government, and Marois will the first woman to become Québec’s premier, although it seems likely that we’ll see new elections long before the five-year government runs its course. 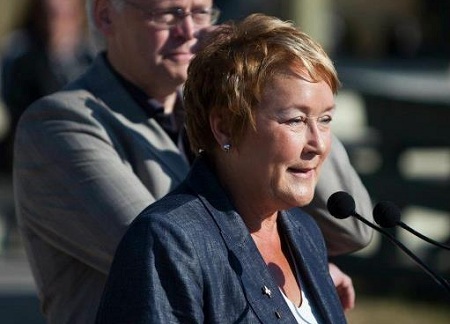 Marois’s victory speech was marred by a horrific assassination attempt, which left one man dead and another injured. Léo Bureau-Blouin — the articulate 21-year-old and student spokesman — won his seat for the PQ in Laval-des-Rapides. The leftist Québec solidaire won both seats for Amir Khadir and rising star Françoise David, but achieved a total vote of just 6.03%. That, however, combined with the 1.90% that the breakaway sovereigntist Option nationale won likely hampered the PQ in its efforts to win a majority government — that’s nearly 8% of the electorate that would likely not have supported the PLQ or the CAQ. Charest stepped down as leader yesterday after three decades in political life and after nine years as Québec’s premier. Charest lost his own election district, Sherbrooke, which he has represented in either the federal House of Commons or Québec’s Assemblée nationale. Marois has already started to move forward on ending Charest’s planned tuition hikes on students, the controversial Bill 78 limiting street protests and introducing changes to Bill 101, strengthening and enhancing the French-language requirements in the province. Previous PostPauline Marois and the Parti québécois will form Québec’s new governmentNext PostWhat next for Liberal leader Jean Charest?